The following is a list of the forms currently available with a RiskRevu.com account. Our digital forms library is continuing to expand. Check back frequently for updates to the list. Annual Personal Risk Evaluation – This form allows a client to build their own renewal questionnaire. 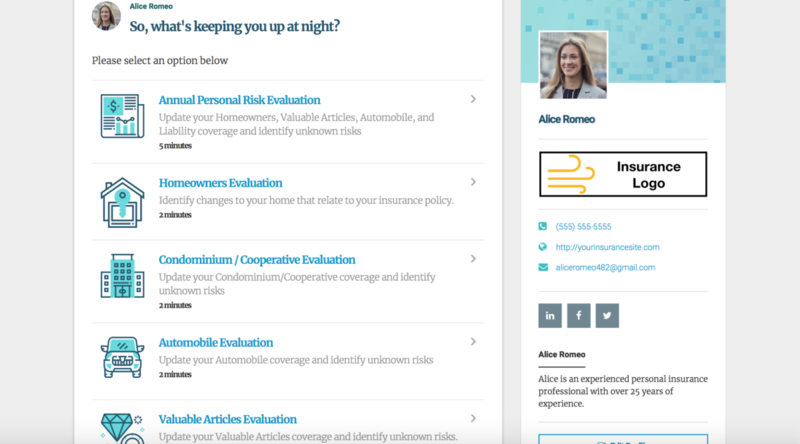 They can choose to complete questions from 6 different sections including: Home, Second Home, Valuable Articles, Automobile, Liability and Life Events. Automobile Evaluation – Clients may just want to review their automobile insurance or that is all they have insurance for. This form is a renewal questionnaire that will ask pertinent questions about their automobile insurance. Condominium/Cooperative Evaluation – Clients may just want to review their Condominium / Cooperative insurance or that is all they have insurance for. This form is a renewal questionnaire that will ask pertinent questions about their condominium / cooperative. Flood Risk Evaluation – Send this form to clients to help them evaluate their risk of flooding at home and verify several rating factors for a personal flood insurance policy. Homeowners Evaluation – Clients may just want to review their home insurance or that is all they have insurance for. This form is a renewal questionnaire that will ask pertinent questions about their home. Personal Liability Evaluation – Clients may just want to review their liability insurance. This form is a renewal questionnaire that will ask pertinent questions about their liability exposures. Valuable Articles Evaluation – Clients may just want to review their valuable articles insurance or that is all they have insurance for. This form is a renewal questionnaire that will ask pertinent questions about their valuable articles. Automobile Insurance Form – Collect information needed to obtain a quote for Automobile insurance for your clients. Business Cyber Liability Form – Collect information needed to obtain a quote for Business Cyber Liability insurance for your clients. Business Owners Insurance Form – Collect information needed to obtain a quote for Business Owners insurance for your clients. Condominium / Cooperative Insurance Form – Collect information needed to obtain a quote for Condominium / Cooperative insurance for your clients. Group Health Insurance Form – Collect information needed to obtain a quote for Group Health insurance for your clients. Health Insurance Form – Collect information needed to obtain a quote for Health insurance for your clients. High Hazard Flood Zone Insurance Form – Collect information needed to obtain a quote for High Hazard Flood Zone insurance for your clients. Homeowners Insurance Basic Form – Collect basic information needed to obtain a quote for Homeowners insurance for your clients. Homeowners Insurance Comprehensive Form – Collect detailed information needed to obtain a quote for Homeowners insurance for your clients. Individual Life Insurance Form – Collect information needed to obtain a quote for Life insurance for your clients. Motorcycle Insurance Form – Collect information needed to obtain a quote for Motorcycle insurance for your clients. Personal Excess Liability/Umbrella Insurance Form – Collect information needed to obtain a quote for Umbrella insurance for your clients. Personal Insurance Package Policy Form – This is a comprehensive form that can collect information needed to quote all or any of the following lines of business all in the same form. Home, Condominium/Cooperative, Renters, Valuable Articles, Automobile, and Excess Liability. Personal Insurance Package Policy – Multiple Homes – This is a comprehensive form that can collect information needed to quote all or any of the following lines of business all in the same form. Up to three Homes, Condominium/Cooperative, Renters, Valuable Articles, Automobile, and Excess Liability. Preferred Flood Insurance Form – Collect information needed to obtain a quote for Preferred Flood insurance for your clients. Renters Insurance Form -Collect information needed to obtain a quote for Renters insurance for your clients. Surety Bond Form – Collect information need to obtain a quote for a surety bond for your clients. Travel Insurance Form – Collect information needed to obtain a quote for Travel/Trip Cancellation insurance for your clients. Valuable Articles Insurance Form – Collect information needed to obtain a quote for Valuable Articles insurance for your clients. Commercial Certificate of Insurance Request Form – This form can be sent to a client who needs a commercial certificate of insurance. It collects the information needed for a commercial insurance professional to create a certificate of insurance for their client. Contact Information Update Form – Send this form to a client to allow them to provide updates to their contact information (e.g. Phone numbers, email addresses and additional contacts). Legal Entity Information Form – This form can be sent to a client who placed their home or other asset into an asset protection entity (e.g. LLC, Trust, etc…). It will gather information about that entity to share with an underwriter. New Vehicle Information Dealer Form – Send this form to a dealer to collect information about a new vehicle your client is purchasing or leasing. New Vehicle Information Client Form – This form is for clients to complete when they are purchasing or leasing a new vehicle. Producer Issuance Form – Personal Lines – A producer should complete this form prior to issuing a new policy to ensure they have all the pertinent information needed to issue it accurately.